ecosense media & communication beteiligt sich an dem EU-unterstützten Projekt Sustainability Maker. Some 30% of the world’s population consumes approximately 70% of total resources. In Europe, the major negative environmental impacts of consumption occur in three areas: (1) housing and household energy consumption; (2) mobility and tourism; and (3) food and agriculture. The European Union has established policies and strategies towards sustainability and eco-efficiency. These can also be adopted by and viewed as more sustainable role models for other nations and regions. There are also promising sustainable technologies available, but their implementation does not match rapid population growth. Many stakeholders are already contributing to solving problems such as climate change, the loss of biodiversity, water and food scarcity, poverty, health issues and social crises. However, they face many hurdles, notably a lack of power, knowledge, coordination and funding. 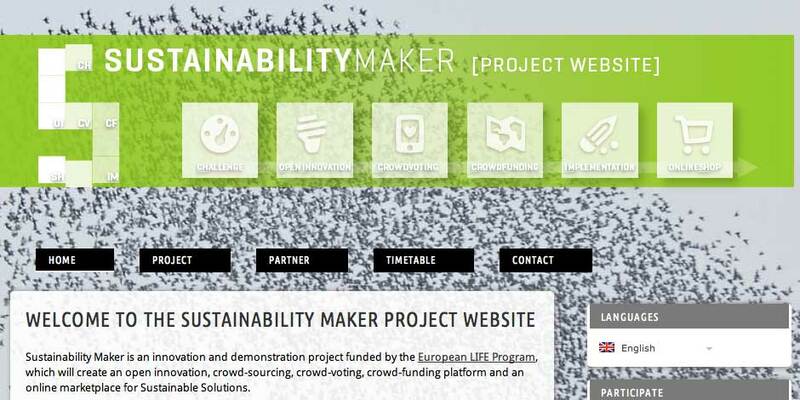 The ‘Sustainability Maker’ project proposes to use the enabling opportunities of new media and other innovative ‘bottom up’ strategies to resolve urgent sustainability problems and to implement European environmental and social policy. Its overall goal is to create an online platform and network – the ‘Sustainability Maker’ – whose aim will be to become a powerful initiative towards the resolution of sustainability-related problems. Offering a collaborative approach to finding creative solutions, the ‘open innovation’ platform will combine a website and mobile application, to be supported by annual conventions (physical meetings). The project will bring together people who have identified sustainability-related problems with those who are to develop, or who have already developed, solutions. In addition, the project will help to devise funding solutions for such initiatives. An innovative ‘Sustainability Maker’ financing instrument.